Jeremy Pollack was born and raised in Hawaii, on the island of Oahu. After graduating from Punahou School in 2005, Jeremy attended Vassar College in Poughkeesie, New York. In 2009, Jeremy moved to Boulder to attend law school at the University of Colorado. As a law student, Jeremy interned at the U.S. Department of Education’s Office for Civil Rights, and practiced as a student attorney in the Natural Resources and Environmental Law Clinic. 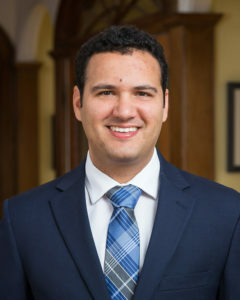 After graduating from law school in 2012, Jeremy received a judicial fellowship to work for the Colorado Supreme Court in the chambers of the Honorable Justice Monica Márquez. In 2015, Jeremy joined the Law Offices of J.M. Reinan, P.C. as an associate attorney. Alongside attorneys Jerome Reinan and Jordana Gingrass, Jeremy has represented clients on a variety of civil cases including nursing home negligence, wrongful death, consumer protection and professional malpractice. Jeremy is admitted to the bar in both Colorado and Hawaii. Jeremy is passionate about helping individuals and families seek justice for themselves or their loved ones. Jeremy believes that all segments of society are entitled to quality representation, regardless of a person’s age or mental and physical condition. Jeremy believes it is important to hold negligent individuals and healthcare facilities accountable for causing harm to their patients, even if the harm is primarily psychological or emotional.